Unlike the Henschel Tiger, and most other tanks, it is powered by a rather unusual combination of 2 Hybrid gasoline-electric engines. This brings some unusual handling characteristics to play. For example, because it is driven by the electric engine, it can go backwards just as fast as forward! So it has one of the highest reverse speed in the game now. On the other hand, its top speed in both directions is limited (only 31 kph, and it feels like it could go faster without the limit). It is also a little heavier than the Henschel, has narrower tracks, and its engine output is lower. Soft terrain isn't a friend of this vehicle. Transmission is mounted at the rear of the vehicle - no more catching fires from frontal shots! It uses the same turret and gun as Tiger H1, but it can use APCR shells. It uses the same hull as Ferdinand tank destroyer. Turret hasn't got an electric drive - its traverse speed is therefore very slow. Lower side hull is only 62 mm thick so watch out. An additional 26 mm of armour is bolted in front of the machine gun port on the hull. Turret front covered by gun mantlet has variable thickness depending on exact place, ranging from 90 to 200 mm of armour. Driver's view port is actually far from being a weakspot, it still counts as part of 200 mm of front armour + 40 mm. Stick with this type of shell as it's the best. It will do incredible damage to any encountered tank, except SPAA, AA guns, or AI artillery. It may struggle with some heavier tanks like the IS-1, IS-2, or American heavy tanks at long ranges, but well placed shots from close range or sides will do the job; all other medium and light tanks will be history as soon as this shell make a contact with them. This shell, however, will almost always over-penetrate all but the most armoured SPAA vehicles, so it is best to use HE or machine gun fire. The heat shell is best avoided as it deals less damage than the APBC Shell and has a much lower muzzle-velocity, meaning that the gun has to aim ridiculously high for sniping. It also offers less penetration than APBC at all ranges. As the APCR round for the gun, this will give the tank the greater edge needed to take out heavily protected tanks. The HE shell is completely ineffective against all but SPAA or the AI artillery on the Kursk and Ash River maps, and the machine gun mounted on the Tiger has proven quite capable of dealing with these. Keep a small supply of this shell on hand if planning to flank the enemy and take out their SPAA or artillery, but avoid them for everything else. Ammo racks of the Pz.Bfw.VI (P). With this tank, a calm and patient player will be able to rip apart lots of enemies, before being knocked out. 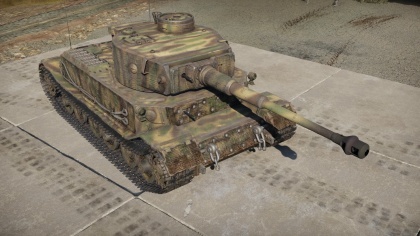 The Tiger P can easily survive a duel with other Henschel Tigers, because its hull armour is much stronger, and they use the same turret, that is rather hard to be penned by Short 8.8cm guns they use. One of the flaws of its armour design is that it cannot be effectively angled AT ALL. Because of its front hull cheeks, that are only 82 mm thick, even the slightest angling makes them very vulnerable to all guns, and to make matters even worse, ammunition is stored right behind them on both sides (unless one carries less ammunition). 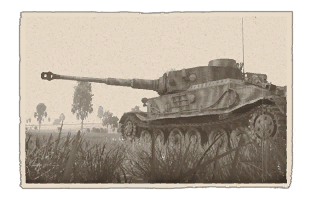 Gameplay is very similar to the Tiger E. Avoid direct close range confrontations (although the Porsche can hold its ground a lot better there), where its weakspots can be targeted, or be flanked easily, and rather use its excellent accurate gun to outshoot the opponents from afar, while using the terrain and various obstacles as cover (Hulldown maneuver). Refrain from angling the armour, as opposed to Box-shaped Henschel Tigers, because of the vulnerable front hull cheeks and much thinner side armour. 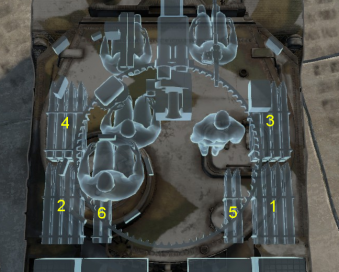 204 mm of front hull armour can defeat a lot of shells even completely unangled, and even more at high distance. Remember about the high reverse speed (31 kph! ), if the situation is becoming dire, try to retreat from it by reversing while still facing the opponents with 200 mm of front armour and dangerous gun! Lastly, remember that that the Pz.Bfw.VI (P) BR is quite high, and it can meet opponents that are almost invulnerable to the 88 mm gun from the front (even when using APCR), and/or can still instantly destroy the Pz.Bfw.VI (P) with one well aimed shot. Strong 200 mm (100 + 100) frontal armour. Low chance of fire from front shots thanks to the rear mounted transmission. Accurate gun for long ranges. Reverse is just as fast as forward drive. Premium vehicle - Earns much more Silver Lion/RPs per battle. Huge, exposed sides due to vehicle length and front hull cheeks are prominent weak points. Small weak spot on the hull - the machine gun port. Often not enough penetration against higher BR vehicles it faces. Mobility and top speed is average, turning the tank bleeds speed quickly. Gun mantlet presents a big weakness due to some flat areas. The 204 mm of frontal armour will not stand against high-powered rounds. In 1942, a program to submit a heavy tank design weighing 45 tons mounting the 88 mm KwK 36 cannon derived from the successful 88 mm FlaK gun was launched on May 21. Two companies, Henschel and Porsche were contracted to design the tank hull that could mount the turret designed by Krupp. Porsche's development for this project was to upgrade their existing VK 30.01 (P) medium tank design, adapting parts from the tank into their new heavy tank. This heavy tank designed by Porsche was designated the VK 45.01 (P) and was powered by twin air-cooled gasoline Porsche Type 101/1 engines that were in the rear of the tank. Each engine drives a separate generator on each side of the tank that would then each power one of the two electric motors for each track. This design resulted in the tank being prone to breakdown due to complexity, high-maintenance, and deficiency in copper quality available for use. The vehicle was displayed to Hitler on his birthday on April 20, 1942 alongside the Henschel version VK 45.01 (H). Unlike the Henschel variant, which had the turret mounted mid-hull, the Porsche version had the turret mounted far forward on the hull in order to make space for its rear engines and drive system. The tank was then evaluated by a technical commission headed by Albert Speer and it was found that the Henschel design was superior to the Porsche design as it was more mobile, more reliable, and easier to enter production. The Henschel version was accepted into service by the German Wehrmacht and was designated the Tiger I, while the Porsche variant was sidelined. Only five VK 45.01 (P) were produced before its rejection. Before even the evaluations began, Porsche was so confident that their design would be chosen that one hundred chassis of the VK 45.01 (P) was already produced. With the Henschel version chosen, the chassis were no longer needed to be made into a tank format, but it would be a waste to simply scrap them. These chassis were converted into casemate structures that could mount the new 88 mm Pak 43 cannon, which was longer and more powerful than the KwK 36 on the Tiger I. This would be called the Ferdinand tank destroyer, later redesignated as the Elefant. Three VK 45.01 (P) was also converted into recovery vehicles designated the Bergepanzer Tiger(P). Out of the five VK 45.01 (P) produced from its development to its rejection, only one saw service in World War II. The tank had the chassis number 150013 and was converted into a command tank, thus was designated the Panzerbefehlswagen VI (P). As a command tank, the tank would have much more radios than usual to allow for command communication between tank units and headquarters. Another feature on the Panzerbefehlswagen VI (P) was that an extra 100 mm of armour was welded onto the front hull armour, bringing the original 100 mm hull armour to 200 mm effective in thickness. The tank was used by Hauptmann Grillenberg in turret number 003 and the tank saw service on the Eastern Front with the Ferdinand units, serving in Tank Destroyer Battalion 653. It was deployed in April 1944, but was then lost in July of the same year. Skins and camouflages for the Pz.Bfw. VI (P) from live.warthunder.com. This page was last edited on 24 February 2019, at 09:12.